The long-standing rivalry between Azeroth’s most brilliant and creative (albeit questionably insane) inhabitants rages on in Hearthstone‘s first official expansion – Goblins vs. Gnomes! 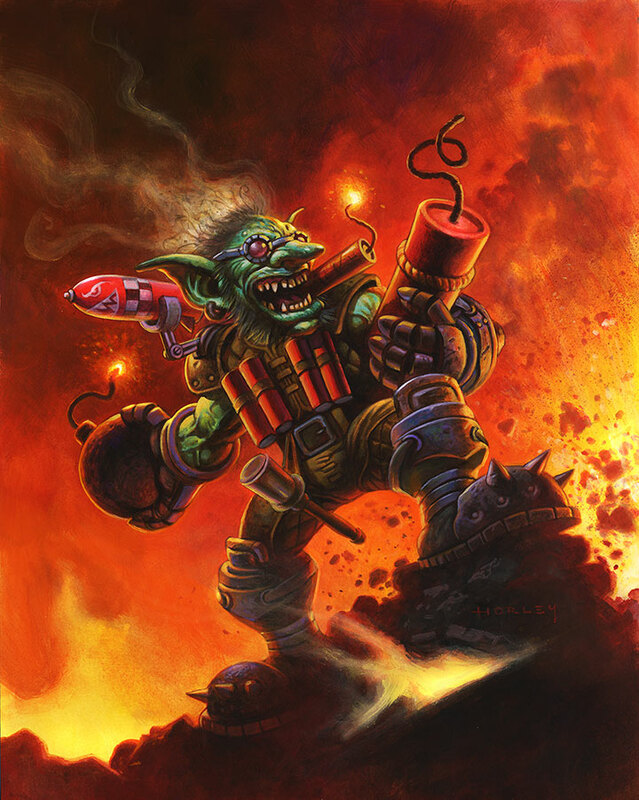 Locked in an eternal battle to create the most epic, explosive, destructive, and devastating contraptions and contrivances, the goblins and gnomes we’ve come to know and (occasionally) love have officially tinkered their way into the rules of the game. Players now get to use the creations of these little guys as a new minion type is introduced – Mechs. Sure to change up the current state of the game, these gadgets will be both neutral and class-specific; they’re sometimes unpredictable, but always interesting. So whose side are you on – that of the cunning, explosive, and chaotic Goblins, or the tinkering, grinding, and bending Gnomes? We’ll help you make that decision by breaking down the two factions and some of the stand out cards and strategies for each. Let’s start with the Goblins! As mischievous as they are industrious, the only thing Goblins like more than a pile of shiny gold is a gigantic explosion. Best known for their damage-dealing devices, it should come as no surprise that these dangerously crafty engineers have developed countless gadgets with, some might say…unreliable results. But who said unreliability was a bad thing? Goblins seem quite content with the volatile nature of their inventions, so the Goblins vs. Gnomes expansion has added a slew of new RNG-based cards, making every Goblin cackle with maniacal glee at the increase of randomness, chaos, and, of course, fun. Random doesn’t mean entirely luck-based though; there’s skill involved in understanding the concept of calculated risk with RNG and damage dealing, and Goblins are masters of their craft there. Lovers of disorder will rejoice with cards like Bomb Lobber. A rare neutral minion costing 5 mana, at only 3/3, Bomb Lobber is fairly weak…but packs a powerful punch with his Battlecry. He deals 4 damage to a random enemy minion, so while his cost might keep him out of competitive play, the ability to actually control his randomness a bit means he might still prove to be useful. 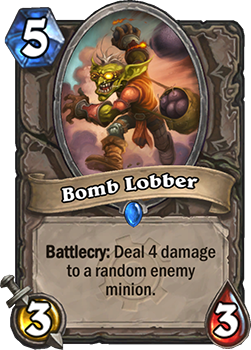 Playing Bomb Lobber when your enemy only has 1 minion or when all available minions have 4 or less health can result in a guaranteed kill, and knowing to hold him back when you’re faced with high-value targets hidden behind smaller minions allows you some flexibility in planning your randomness. …as if that’s a thing, right? 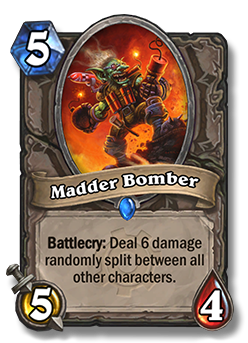 RNG once again rears its beautiful head in the form of Madder Bomber, everyone’s new favorite psychotic arsonist. As a 5 mana 5/4 rare minion, he might not be as popular as his beloved 2-cost older brother, Mad Bomber, but he’s just as fun if you’re into unpredictability and risk. (And if you’re choosing Team Goblins, you’d better be!) Our delightful bomber’s Battlecry deals 6 damage randomly split between all other characters – characters, of course, including your own minions and hero. So if you like true, absolute, random chance, this is your guy! He works best if you don’t have any cards out, understandably, but also works well to trigger friendly minions with Enrage, or minions with on-damage effects. Make the RNG work for you, and if it doesn’t, rejoice in the damage anyway – like a true Goblin. But Goblins are more than just random chaos, right? Sometimes instead of throwing their damage around randomly, they make sure everyone gets in on the fun! 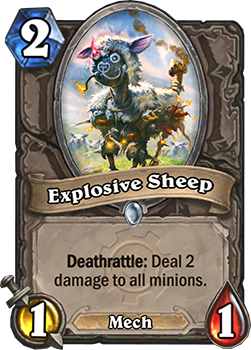 Our new friend Explosive Sheep blows up like only a Goblin-explosive-filled ovine creature could – quickly, and to the detriment of everything in its vicinity. This card is destined to make low-cost zoo decks unhappy in a hurry. 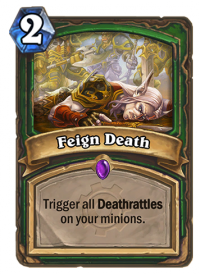 At its worst, it’s a 1/1 for 2 mana that can easily clear the board with its Deathrattle, which deals 2 damage to all minions. But at its best – say, in the hands of a Warrior or Mage – it can trigger without attacking and become easy anti-aggro insurance. 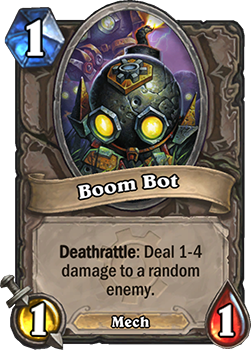 Combine it with other AoE cards like the new Boom Bot (which has a Deathrattle that deals 1-4 damage to a random enemy) and you’ve got an explosion any Goblin would be proud of. Particularly a Goblin like Dr. Boom, the summoner of those adorable little Bots. He may not seem quite so intimidating at first; his 7 mana cost can make him seem underwhelming, but while he might not be the best at actively dealing with threats, Dr. Boom becomes scary at 7/7…once his Battlecry is used to summon two 1/1 Boom Bots. If we consider an empty board, your enemy is going to be forced figure out a way to deal with the Doctor himself, but also neutralize his Bots while minimizing damage. If he doesn’t have an answer? You’re about to have a very good turn. Use his little Bot mechs to create chain reactions with the aforementioned combustible sheep or, if you’re a Hunter, pick up Feign Death and rejoice at the destruction. If you’re siding with the Goblins, you’ll quickly see that the new Mech minion type can easily be used to your advantage. Between Boom Bots, Explosive Sheep, and Sneed’s Old Shredder, their usefulness is probably already obvious, but there are enough new Mechs in Goblins vs. Gnomes that you could make an all Mech deck if you felt like it! You’ll probably want to start that deck with a Piloted Sky Golem. 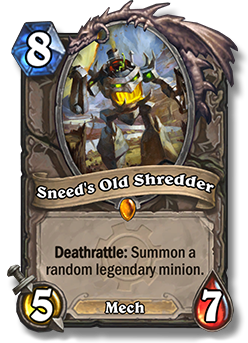 Not unlike Sneed’s Old Shredder, this guy will give you the gift of a random minion upon death – but this time it doesn’t have to be legendary, it just has to cost 4 mana. (And interestingly, in both cases this includes those minions specific to classes other than the controlling hero!) Which is great, because there are plenty of awesome 4-cost minions to cram into your deck. 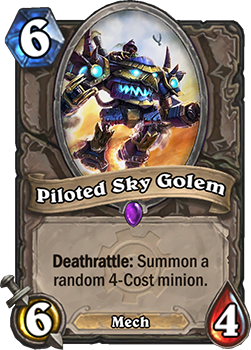 As a 6/4 for for 6 mana, Piloted Sky Golem should be an auto-include to any Mech deck. If you’re a Rogue, make sure to pick up Goblin Auto-Barber to fill out your Mech roster. If you can get this 2 mana 3/2 minion out on turn two after equipping a basic Hero Ability dagger on turn one, you’ll be set with a strong removal tool from the very beginning. Look for synergy with Deadly Poison, Assassin’s Blade, and Blade Flurry, and find comfort in having a decent minion on your side in the meantime. But once your industrious Goblin nature has given you all these Mechs, what do you do with them? Goblin Blastmage is your answer, and a powerful one at that. If you plan to go Mech-heavy with your Goblins (and why wouldn’t you?) his Battlecry alone might make you throw him into your deck. But as a 5/4 for only 4 mana, he’s a pretty solid fighter even if you’re forced to play him without your Mechs around. 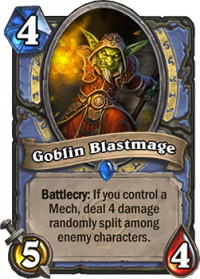 Important to note about his Battlecry is that unlike our Madder Bomber friend who has the potential to damage friendly characters, the Blastmage’s 4 damage is randomly split among only enemy characters. This time with your minions (and your character) safe, the random explosion can almost seem planned! If you’re looking to be an aggressive Goblin, this will be a staple in your deck. With more than 120 mechanically-themed cards being added to the mix (along with a brand new game board and the much-anticipated spectator mode), Goblins vs Gnomes is sure to change the way you think of and build your decks. So why not think of them the way a Goblin would – through the soot-clouded goggles of a mayhem-loving madman? Let your reckless side show and join up tiny green arms with these lovable lunatics. 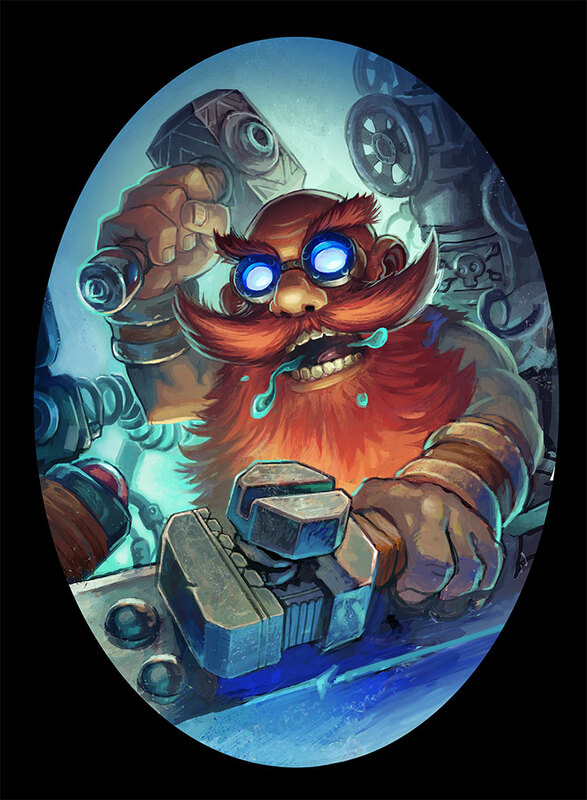 Goblins vs Gnomes will be releasing their hijinx on the Hearthstone world on December 8, 2014 in the Americas region (including Oceania and Southeast Asia) and on December 9 in Europe, Korea, Taiwan, and China. The new cards will be available in the Shop, Arena, and through crafting. They’ll be in their own appropriately-explosive-labeled card packs to distinguish them from classic cards, and will cost the same as expert card packs, in both gold and real money.